I've been reading a book called "This Stretch of the River." It's the response of Lakota, Dakota and Nakota writers to the Lewis and Clark Expedition and Bicentennial. It's an anthology that includes poetry, fiction, memoir, history and literary criticism. 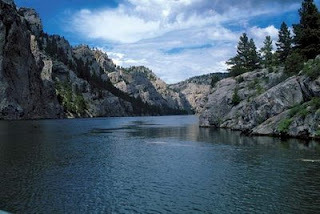 A common thread in much of the writing is the Missouri River. It flows through the pages as it once flowed through the Northern Plains, unhindered and undamned. I remember driving across the Missouri on a beautiful summer day, looking down at the water from a bridge near the Cheyenne River Reservation. The sky was a brilliant blue with small puffy clouds reflected in the glassy surface of the river. As my companion looked into the river, she volunteered, "on a clear day I can see my village." Thousands of people were displaced and dozens of villages were buried by the dams on the Missouri. Whole ecosystems were changed. Cultures were impacted. Even today, the bones of Native people appear as evidence that burial grounds were immersed as well. There's a similar situation half a planet away. I was first drawn to the struggle along the River Narmada by some postcards. They showed tribal people standing waist deep in the waters of the river. The people vowed to stay in their homes and villages as the government flooded them. But the government wouldn't allow them to drown. The authorities took to boats and arrested the protesters while they were in the water. 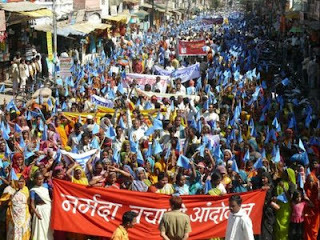 The Narmada struggle continues. The Adivasi people who have lived along the river Narmada for generations revere the river. For them it is a sacred entity. They walk it's length each year in recognition of the blessing it is and the life it brings to them. They object to the idea of controlling or curtailing its flow. I've heard the same concern expressed here in the U.S., by a Lakota teacher. He spoke about the rights of the water people. Water was personified, perhaps so we might better understand and relate. Significantly, for the Lakota, one of the rights of water is to flow where it will, unhindered, undamned. Increasingly, we need to recognize the rights of the earth, of water and trees and animals and soil. Doing violence to the sacred entity that nourishes and sustains us is ultimately self destructive. Tribal people all over the planet are risking and sometimes losing their lives to warn us.